Another heartwarming story out of Dallas over the weekend occurred when a Black Lives Matter rally met up with white counter protestors wearing cowboy hats and flying Texas flags. A representative from each group met in the middle of the street, while TV camera crews were rolling. After shaking hands and chatting a little, the black group decided to cross the street so they could join forces. “How’re y’all doin’?” was the greeting, and then the two sides began hugging each other. He later broke down in tears crying from the poignant scene. 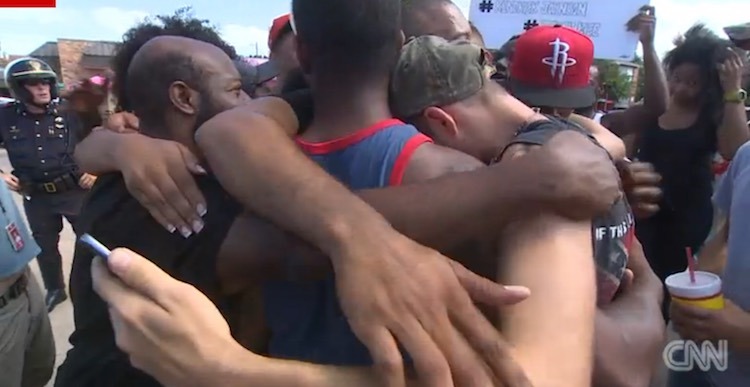 Before going home they gathered in a huddle and prayed together for the city, with a police officer assigned to keep the peace joining in.